It is a general rule that the person who resorts to insults is the one losing the logical argument. This is a principle often forgotten these days, now that most public debate has descended to the level of mud-slinging and innuendo. But it is still a shame to see F1 joining the herd and happily accepting mere name-calling as legitimate contributions to debate. As an interesting exercise, try applying this rule to the progress of McLaren's year-long battle with the FIA. I cannot recall one instance of a McLaren representative resorting to insult in a public statement, although I do not doubt that some ripe phrases were used to describe the opposition behind closed doors. In contrast, the FIA and Ferrari have hurled insults and accusations at every opportunity, apparently with impunity. The cool fuel case was only the latest instance where this imbalance was demonstrated. The Ferrari lawyer, Nigel Tozzi, called the McLaren team "shameless hypocrites devoid of any integrity" in his opening preamble. For some reason, it seems to have escaped the court that this is pure opinion and irrelevant to the case they were supposed to be considering. The BMW lawyer (who shall be nameless - we have enough new legal stars made famous by McLaren's troubles this year) added that McLaren were showing "naked opportunism" in lodging the appeal. McLaren's hero, Ian Mill, stuck rigidly to the facts of the case and threw no brickbats at the teams who had apparently been caught cheating. Granted that this all became irrelevant once the court had decided that the appeal was inadmissible, but the conduct of the parties surely says something about the strength of their cases. McLaren seems to believe that the letter of the regulations is what counts and they point to the rule and ask why it was not applied in this case. Their opponents, however, believe that it is sufficient to look at McLaren's motivation in appealing at all - they are after the extra points to make their boy a champion, they shriek. As pointed out by GrandPrix dot com this morning, the Appeal Court neatly dodged the issue by declaring that the appeal had not been made in the correct manner and therefore refusing to judge it. But one wonders, since there were no objections to the the insults thrown in the courtroom, whether the judges would have allowed such statements as admissible evidence. McLaren's motivation and moral standing are completely irrelevant in judging whether Williams and BMW should have been penalized or not. The case is about the regulation and how it is to be policed, not about McLaren's reasons. If there were special circumstances that dictated that the rule not be applied to the letter in this instance, that should have been made clear so that F1 teams can be reasonably confident that the stewards' judgement can be trusted in the future. Unfortunately, now that the court has used its one available means of escape, nothing has been clarified and we remain unsure of the stewards' impartiality. It was ever so, it seems. I can remember that as far back as the sixties, the governing body was suspected of favoring Ferrari in its decisions. It is surely telling that today, fifty years later, the same suspicion is alive and well and flourishing in an atmosphere where name-calling and opinion are accepted as valid arguments in any dispute. As it happens, in this instance we can all be pleased that Kimi remains champion - not that there was ever any danger that he would be deposed in this particular courtroom. But once again suspicion of bias and uneven application of the rules by the FIA lives on, no doubt to cause controversy and bad feeling another day. It really must mean something that, even when its decisions are popular, the FIA comes out smelling of something other than roses. The FIA statement points out that there is insufficient proof of the fuel and ambient temperatures, as well as having the "inadmissible" point. In other words, BMW and Williams would have been acquitted on procedural grounds even if McLaren's appeal had gone ahead. This is what every news outlet appears to have missed. Which is irritating, really, since it further underlines the FIA's ineptitude at administering its own regulations. Naturally, the point that insults have no place in the court room or in any other debate is important. I'm just not convinced that the court actually took any of the insults into account. It is simply that in its attempt to move people's eyes away from its own ineptitude, it has given the impression that it wrongly listened to such shameful talk. That, of course, is why the FIA did not want the case to be considered, Alianora. To have their inability to decide which of the measurements of ambient temperature should be used in applying the rule would expose their incompetence, just as you say. Will they now take steps to ensure that ambient temperature is accurately measured in future cases? Who knows? And that really is the point - McLaren don't know and neither do any of the other teams. It's called "square one", I believe. It doesn't really matter whether the judges took account of the statements or not - the point is that they allowed them. In so doing, they are giving the impression that this is perfectly acceptable behavior in their court and they cast further doubt on their ability to judge anything in consequence. We don't know if the insults were allowed in court, as no context has been offered for them. Admittedly, it is unlikely that the Ferrari lawyer was thrown out, otherwise we'd probably have heard about it by now. I would certainly concur with your opinion of any judge who let that sort of thing go by without comment, though! Mario Thiessen said something at the end of an article on pitpass about the matter now going to the Technical Working Group. While it is good that the fuel rule is being discussed, I have a feeling that it will merely issue yet another "clarification" of the type that caused the problems leading to this court case. And another question that just struck me - since Ferrari was neither a team under investigation nor a potential beneficiary of any disqualification, why was anyone from Ferrari allowed in the court in the first place? I was a bit surprised by Ferrari's representation as well, Alianora, but it may be a misunderstanding resulting from the wording of the news releases. The reports describe Nigel Tozzi as "Ferrari lawyer" and "Ferrari's representative" but that may be a reminder that he has represented Ferrari in the past - perhaps the FIA were paying his fee this time. Why is some of this language not considered to be bringing the sport into disrepute. The fuel rule is just stupidly complicated. They should simply say that it is not allowed to be less than 15 degrees. Why refer to ambient temperature? It just creates potential loop holes. I would go even further, Steven, and ignore what the teams do with the fuel. If they want to cool it until it freezes, why should we care? They will all do it so no-one will have any unfair advantage. If Scott Speed can be fined $5000 for being rude in the presence of a steward, then surely these lawyers should also be fined $5000, on the spot, each time they insult others in front of an FIA official? Naturally that would be $5000 each time - that should soon get the perpetrators to behave! The fuel rule is compared to ambient so that if F1 goes somewhere cold, then the fact that the ambient is low won't affect the legality of the cars unduly. Remember that the temperature is supposed to be measured as it enters the car and that the rule is over twenty years old. 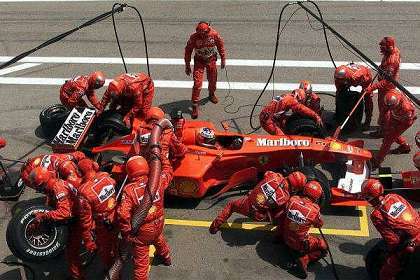 It's absolutely needed so that teams don't exceed the refuelling speeds, which could itself present a safety hazard. The freezing point of fuel is well below zero - hence why cars work in places like Moscow in mid-winter - so it probably isn't feasible to have mandatory freezing. But it would be fun! But yes, it would be interesting to see some of these rules and draconian penalties applied in the other direction for a change. Not that it will happen, of course. Just as ice cube fuel won't, more's the pity. I happen to be one of the ban-refueling brigade so all this ridiculous complication in the rules seems doubly unnecessary to me. I did think about F1 going somewhere cold but I still hink a fixed temperature for fuel makes the rule much less likely to be 'interpreted' in a controversial manner. In the event that a race was run at a lower temperature a new fixed temperature could be decided upon and circulated to the teams. The other far simpler option is to ban chillers. That is also considerably more environmentally friendly. And of course as we all know the proper answer is to ban refuelling. Now that Ross Brawn is at Honda and Ferrari don't have the advantage of his strategies that is a real possibility. For me a GP will always be a couple of dozen drivers leaving the grid and driving without any form of assistance for 200 miles. Steven Roy WINS ! He was the first to say the magic words, "ban chillers." Now there's something MadMax could ban and do us all a lot of good. But I have to draw exception to his last remark, ".....driving without any form of assistance for 200 miles. " Does that include power steering Steve? Maybe if you reduce the wing angles to zero, or reduce the tread width by half!!!! and what about power assisted brakes? Steering wheels without switches and buttons......Hmmmm? Ah, for the "good old days". A further expansion on the discussion.......what do we think of energy recovery systems, are they going to fall under the guise of 'driver aids'. The way I see it since Senna's death Max has done everything he can to stop cars overtaking or running close to each other on track because he believes it is safer. So we have had his chess comments, the nonsense of the centre downdraft wing, the latest nonsense from the overtaking working group and any number of other things which negatively impact wheel to wheel racing. For me despite all his protestations about being green Max sees the energy recovery systems are a means of creating overtaking with the minimum chance of a serious accident occurring. Instead of two drivers being together at near identical speeds in a braking or turn in area one driver will fly past the other because he a pressed a button. Therefore the time they are side by side will be significantly less and it will happen in a straight line. This of course has nothing to do with talent, ability trackcraft or any of the other things we consider to be good driving. It is simply pressing a button when someone else does not. On the subject of power steering etc. I have long been of the view that car design has been allowed to follow a path that is wrong for three decades now. Max wants to make F1 relevant to the real world. What is relevant about cars that can pull 5G but only on a billiard table. I think anyone who has never driven on a track would be absolutely amazed at what are considered to be surfaces that are too bumpy for F1. If you drive a road car over them you cannot even feel the bump. I mean you do not know that there is a bump there. It feels like a billiard table. As a result of the aero route of car design we have tracks that bear no relation to those that existed before. We have drivers who in other times could have become legends of the sport who are not given drives because of their strength/fitness rather driving ability. Jan Magnussen beat Senna's F3 records but lasted no time in F1 because he simply wasn't interested in living like a monk or training like an Olympic athelete. At the time he was pilloried for a lack of dedication but I don't ever remember anyone having a go at Gilles Villeneuve who when asked about training said he bought a pair of shorts once but would rather train by taking a 4X4 up some insae incline. One of the reasons for Allan McNish not being given a drive at McLaren was beacuse they were worried that his slight physique would not handle the rigours of an F1 season. This is a driver Marlboro chose to sponsor in F3 in preference to Mika Hakkinen. The two of them had Marlboro sponsorship in 1988. Marlboro dropped Hakkinen in favour of McNish. That is how good he was but he only did one season in his 30s because car design has reached a point where great drivers are not given a break because of perceived physical limitations. Of course McNish has since proved with quadruple stints at LeMans that he could have handled it but too late. If Max wants to improve racing, make it more relevant and make it safer then he has to massively reduce the amount of downforce the cars generate. There is a cyclic theory that has been around for some time that overtaking has only realy been a problem for 5 years. You can go backe 10 years ago and people were saying that until 5 years previously overtaking was not too difficult. In fact the problems started at the end of the 70s. Gilles Villeneuve once said that the problem with modern racing cars is that you cannot overtake because you cannot get close to the car in front because you lose airflow to the front wing. Sound familiar. He went on to say that he would take the wing off. Not reduce or modify them take them off and throw them in the bin. Fit 21 inch wide slicks(at the rear) and a 5 litre engine. Effectively massively reduce aero grip, increase mechanical grip and have cars with more power than grip so that the driver can control them with the throttle. Sorry this reply has spun out to be almost as long as your original item Clive butit is one of the subjects I feel really strongly about. I like long comments, Steven - gives me a chance to relax and do some reading instead of writing all the time. The problem is that I agree with everything you say, leaving me with very little to write in reply. I have been advocating the banning of wings for quite some time now and people react with horror. They are so much a part of racing now that it is almost unthinkable to suggest they go. The "impossible to overtake" litany has been going on since the ground effect era started, just as you say. It is probably even more difficult to pass now (but not impossible) but that's what happens when the cars depend on aerodynamics to get them through the corners. Getting rid of wings may be an extreme solution but it is also the only one that will work - permanently. The fitness thing I blame on Michael Schumacher. We were told again and again throughout his career that he was the fittest, most dedicated of all the drivers. As a result, they all have to train constantly, as though this were what won Mickey his races, rather than talent and skill. Funny that he returns in Barcelona to do a bit of test driving and immediately goes faster than anyone else. And this after a week of neck-strengthening exercises! Talent is what counts, not fitness. Get me on the right subject and you will end up spending two hours reading my reply. I'll know when I've hit the right subject then! Hi all. You don't have to cook fancy or complicated masterpieces - just good food from fresh ingredients. Help me! It has to find sites on the: kitchen islands. I found only this - Replica canon for sale. International air tickets from bangkok. One stop resource for all your travel and. Thanks :eek:. Geoff from Ghana. Badly need your help. The older I grow, the less important the comma becomes. Let the reader catch his own breath. I am from Lithuania and learning to read in English, tell me right I wrote the following sentence: "Seo tools nathaniel thomas scott boykin born. Here our new we build pages seo tools - recently published several new free seo tools.At webpagefx we provide internet marketing and seo packages and services, including high roi seo campaigns for harrisburg pa, york pa, lancaster pa and pennsylvania." Thank you so much for your future answers :). Bradney.